In Kentucky we are able to see the North American Goldfinch year round. It has been fun to watch this pair hanging around our yard for the past few weeks. They’re attracted to the bird feeder which is kept full with sunflower seeds. There also happens to be a lot of sunflowers growing in our garden too. 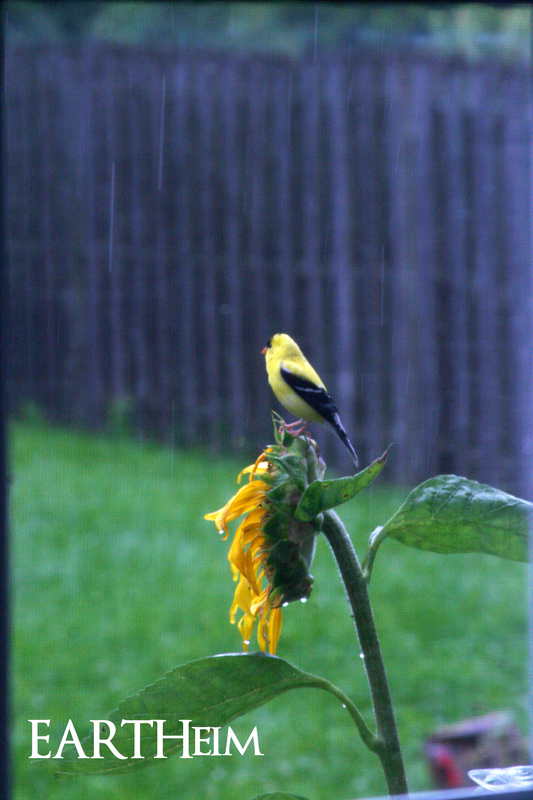 Goldfinches are pretty strict vegetarians, eating seeds of milkweed, thistles, sunflowers, and other fibrous seeds. During the summertime, the males are bright yellow with a black head and black wings with white markings. The females are of a duller yellow and have brownish olive wings. The birds in the winter have even duller colorings for camouflage. These color changes happen when they molt twice a year, once in late winter, and once in late summer. Their size is between 4″-5″ long, and have a wingspan of 7.5″-9″. These finches breed later in the summer than most other North American birds. They wait to make a nest until June or July when seeds of the plants they like to eat have formed. Their habitat is mainly weedy fields and floodplains, but are also found in cultivated areas along roadsides and gardens. They fly with an undulating pattern and often call while flying. I’ve learned to know their call and often hear them somewhere nearby even if I’m unable to see them. The pair is almost always together, whether they’re flying or eating the sunflower seeds. getting the pictures of the birds together is amazing! lovely article. Lovely pictures, Katrina! And a very informative piece about the Goldfinch. I have a few sunflower plants now and will plan to plant more next year. Thank you for sharing. Thanks! They love the sunflowers and purple coneflowers!